When you're reviewing a pull request, you can choose to leave individual comments on specific changes. When you've finished reviewing the proposed changes, you can submit an overall review with a summary comment to approve the pull request or request additional changes. When you're done, click Start a review. If you have already started a review, you can click Add review comment. Before you submit your review, your line comments are pending and only visible to you. You can edit pending comments anytime before you submit your review. To cancel a pending review, including all of its pending comments, scroll down to the end of the timeline on the Conversation tab, then click Cancel review. After you've finished reviewing the proposed changes in the pull request, submit your review. Select Comment to leave general feedback without explicitly approving the changes or requesting additional changes. 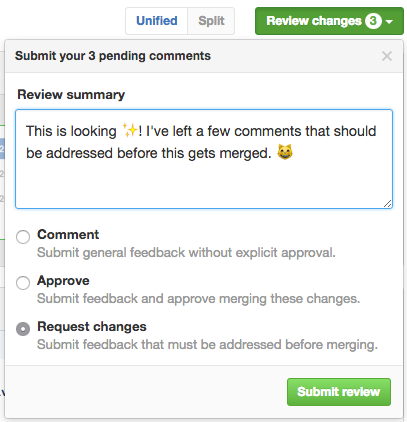 Select Approve to submit your feedback and approve merging the changes proposed in the pull request. 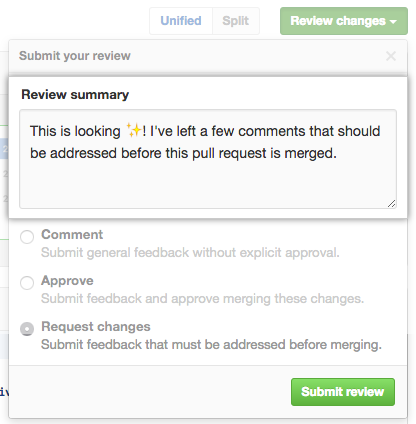 Select Request changes to submit feedback that must be addressed before the pull request can be merged. "Approving a pull request with required reviews"